There is always a first image in my mind when I think of cultures; there are also first visions when I think of the girls of the culture. I was watching television here in Spanish when a commercial came on, at that moment I knew this commercial was my true vision and oldest memory of Latina Girls. This is an advertisement for a special Bra that helps women push up their breast to extreme levels. I truly started to laugh when I saw the commercial on television; for sure, the Latinas like to push up their breast. The developed world looks at the underdeveloped often as if everyone is begging for money, some myth perpetuated because for the first time in their life they saw a beggar. The truth is, countries like Peru are the same as any other country, they think about fashion, clothes, music, they play with their cell photos. Fashions are extremely prevalent in any country on the planet, the desire to look good is universal, and so is envy. 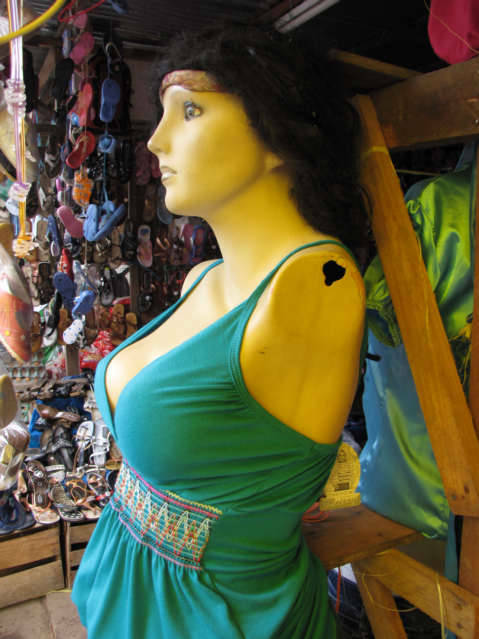 The mannequin here shows the ideal women in this culture, note I am trying to get a real example, my luck has been bad.